New Items on Display at Splash Galleries! We are excited to reveal some great new items on display at Splash Galleries! 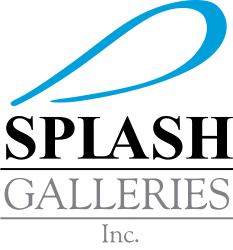 Last Month, Splash Galleries hosted its first Open House. To prepare for the Open House we updated several of our display vignettes and brought in some fantastic new products. Our Showroom is a constant work in progress, but it is always exciting and inspiring to put together new displays. Expect more updates and changes in the next few months too, and check out the Clearance page for the displays we are selling. We are planning another Open House in the future, which we hope will be even more successful and inspiring! One of our favorite new display vignettes features the Madeli Bolano 24″ Wall Hung Vanity in Ash Grey, with a white X-Stone Solid Surface Top and Integrated Sink. We paired this sleek modern vanity with the Kohler Stance Single Hole Faucet in Chrome and accessorized the vingnette with Kohler’s Loure/Stance series towel ring and bar. This look would be perfect for a modern powder room, or use the larger Bolano Double Vanity for a master bath! Vessel Sinks are now front and center as you enter our showroom, a colorful, sparkling display of artistic glass, copper, and stone varieties. The Madeli Ercolano artistic glass vessel stands out with its blue ombre hand painted finish, metallic flecks and artisan glass work details. This sink is a sight to behold. Also displayed here are glass vessels from Oceana and copper sinks from Masterpiece Sinks. Several of the copper sinks are listed in our Clearance Sale, so if you see something you like, give us a call or stop in before its gone! We have two new Freestanding Tubs on display as well. Both are from Hydro Systems, the Estee WD and the Splash 5638! Both tubs are highly versatile freestanding tubs that allow for use of a standard Roman Tub Filler rather than the more costly freestanding styles of Tub Fillers. The Estee WD is on display in a Premium color, Ice Grey, but is available in White and a variety of other stylish colors. We recently added 4 new vanities from Kaco International to our showroom vignettes. Kaco vanities are furniture quality, wood construction, with a variety of granite and quartz tops. First we have the Arlington Vessel Vanity in Cherry with Absolute Black Granite Top and Sink. We have paired this classic traditional style vanity with a California Faucets Wall-Mounted Encinitas Faucet in Uncoated Polished Brass, a finish that is rising in popularity! Soon we will also have the Arlington 36″ Vanity in Ebony with a Gold Hill Granite Top, once the display is complete, we will share some photos! Next we have the Kaco Metro 30″ Vanity in Unusual Gray (painted finish) with a Snowflake Granite Top. For this vignette we decided to go a little more modern and mounted the Kohler Purist Faucet and Accessories in Polished Nickel, and finished the vanity with faceted cabinet pulls from Top Knobs, also in Polished Nickel. The Toilet we used in the display is the Kohler Memoirs Stately with the Purefresh Closed-Front Seat with a LED Night Light and Deodorizer. Next we have the Kaco Mount Vernon 36″ Vanity with Absolute Black Granite Top which we paired with the Kohler Kelston Widespread Faucet and accessories in Brushed Nickel, and finished with Brushed Nickel Cabinet Pulls from Top Knobs. These are just some of the beautiful new items we have up in our Showroom today, and there are still many more to come! Hopefully within a few weeks we will be revealing some new kitchen displays from some of our favorite brands, so stay tuned! Are there items you would like to see more of? Feel free to contact us and let us know!